Double hung windows feature classic styling that has been a favorite design feature of traditional New Jersey homes for many years. You’ll experience the benefits of replacing your old windows immediately since new windows saves money on cooling and heating, enhance the interior of your home and adds to its curb appeal. A new double hung window installation will transform your home from ordinary to outstanding. What’s more, they provide one of the best returns on investment of any New Jersey home remodeling or home improvement project. Double hung window installation uses a vertical slider so the inner window pane slides up and down in the frame. Double hung windows are connected to weights via a rope which enable them to move. Because of the way the window is designed there must be some clearance, even if it is small, to allow the window to slide in the vertical channels. The upper window in the frame also has the ability to move down. 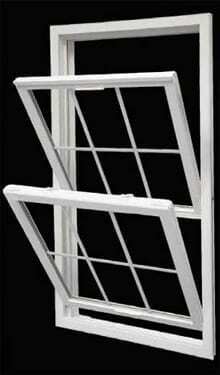 This allows for the escape of hot air through the upper window, while cool air enters the room.